Case Study: The new site…. We’re sure you’ve noticed that something looks a little different around here. Welcome to the new website! When we were undertaking our re-branding process, we knew the website would need an overhaul as well. There was a lot we loved about the old website – the playful navigation and rollovers, the animating blog posts, and, of course, the lobster claw. And there was also a lot we didn’t love – yes, we know, we know, the boxes on the home page weren’t always the most self-explanatory. In designing the new site, our aim was to create a digital experience that echoed the feeling of our rebrand and new logo. With that in mind, we kept some old spaces , updated others and overhauled a lot more. 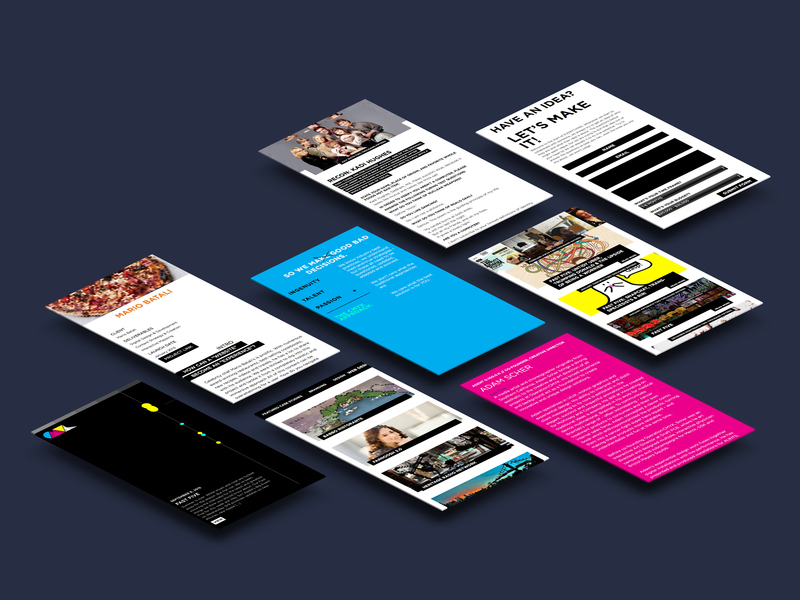 We loved how playful the previous home page was and how it encouraged the user to play with the site in order to find out more information – throwing the boxes to find out about the projects. It was important to keep the sense of play, movement and excitement on our home page. After all, this is the first impression you have on entering the CMYK world. Therefore, it was important it is fun, energetic, and surprising – just like us. This home page needed to be cool, slick, attention-grabbing and novel. But it also needed to be approachable (hey! just like us!). In order to achieve this balance, we threw around a lot of possible directions. Everyone in the studio had ideas on what this should be. But ultimately we all decided it needed to be a Space. A Space that can take on all of the possible ideas of what would like to it to be – now and in the future. OK – but how does that work? We created an HTML5 Canvas on which we can program anything we want. Think of it as a gallery space in which we will have a changing content on a rotating basis and even give outside artist the opportunity to play in it. Currently, it’s a data visualization of every piece of content in our website, organized by time and story. While we may have disagreed on plenty during the re-brand, we all agreed on one thing: the history is long and full of stories and people. We came to this point in the company, not (just) by luck but by springing from story to story, client to client, project to project, and collecting people along the way. The old Operation:CMYK was just as important as the Operation CMYK from two years ago as the CMYK is today. But stay tuned. Watch this space. It will change and grow – just like CMYK. What do you think? You like it? You don’t like it? Miss the lobsters? Don’t worry… they’ll be back (with friends) in the future.